Jimmy was the owner of a nutrition store in Granbury. 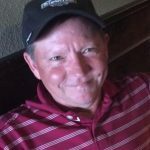 He loved playing golf at DeCordova Bend Estates, where he was a member of the Men’s Golf Association. He especially enjoyed the fellowship with other golfers. He also loved spending time at the beach. He was preceded in death by his parents. A life well lived. I will keep you in my heart always. I’m so glad we had a chance to get to know Jimmy last year when we dropped in on y’all. What a sweet man and oh, how he loved you, Pam! Know that you are in our thoughts and prayers. Love you!! Song of Soloman 2:16 "He is my beloved is mine and I am his; he browses among the lilies" What a beautiful life and love y'all were blessed with. Hold fast to the memories and the images of y'alls love, life, adventures. Prayers lifted for all of you so dear to his heart! Love you Pam! May Jimmy and Jesus guide you all the days of your life in blessings, peace, unfailing love, understanding. Jimmy will long be remembered for his kind heart consideration of others. He will always be a special memory of the Blessings he shared with our family. We love you Jimmy.